Like the food she writes about in her Land and Ladle blog, Erin Meyer has produced a fresh and nourishing interpretation of permaculture’s principles of design. David Holmgren’s book is now available as an updated edition. These are the principles expounded in David Holmgren’s 2002 book, Permaculture — principles and pathways beyond sustainability. I mention this because, for many, David’s principles are all the principles there are. As David’s set of principles ascended to prominence following the publication of his book, so Bill Mollison’s earlier set diminished in prominence. Yet, some permaculture practitioners find Bill’s set of principles to be stated in a more catch, succinct and pithy way that makes them more memorable. They prefer them to David’s. That probably doesn’t matter because both sets are compatible and most useful when combined. Expressed in David’s book as well as by permaculture educators and practitioners, his principles are about the design of infrastructure, about building and land-based systems such as farms and resource management. These are permaculture’s ‘hard systems’, systems that have a physical presence, systems you can walk up to and touch. Yet, they are more than that because the principles are about how we think about the design and building of those things. This ‘thinking about’ design and construction is a ‘soft system’. It is cognitive, conceptual, a product of thought, logical reasoning, deduction and making those important mental connections between things. Bill differentiated between soft and hard systems by calling them ‘visible’ and ‘invisible’ systems and positioned both as critical to the application of permaculture. In some situations, hard systems cannot be built without first completing a soft systems phase. An example is community food gardens which, for a council to allocate land, a hard system, requires the presence of a soft system such as a community gardening policy to legitimate the allocation of resources. Erin Meyer’s interpretation of David’s principles of design is a soft systems approach, though in a different way to David’s. As “rules for living” her interpretation applies the principles to personal life, to the psychology of individuals. It is about personal practices and ways of thinking. It is about our personal psychology, another soft system. This is less a new element in what we have come to know as ‘social permaculture’ than a revival of a concept whose presence seems to have declined in permaculture — the idea of ‘Zone Zero’ (Do you still teach or make use of the Zone Zero concept? Let’s know in the comments). Zone Zero was envisioned as an additional element to permaculture’s zoned landuse system. That stipulates locating different landuses in a set of five zones (or three in the city) according to distance from the dwelling and need for visitation. The Zone was variously defined as the behaviours and practices of people living in the home, the centre of a permaculture design, known as Zone One. It was about the relationships between them and how they manage the home and personal relationships. This gives it a hybrid physical/behavioural, hard/soft systems makeup. It is perhaps Australian permaculture educator/designer, Cecilia Macauley , who has developed this the furtherest with her application of permaculture principles in the personal domestic space. In her blog in Medium, Erin goes through each of the principles and suggests a personal action for applying each. One I found affinity with was her take on the principle of ‘small and slow solutions’. I have written elsewhere that this is an appropriate approach in many circumstances but could be too-little-too-late for others. Sometimes we need big and rapid solutions rather than small and slow. Erin has come to the same conclusion, saying that some of the big challenges we face require the larger scale and rapid response. Examples are ameliorating climate change, finding solutions to the loss of livelihoods to workplace automation, and urbanisation. There is a saying in the tech world that a technology is successful when it is used for things it is not designed for. We could apply that to Erin’s application of David’s principles of design to the psychological space of individuals. This repurposes and enlarges the principles, taking them into territory if not new, then territory seldom visited. Erin writes in the Land and Ladle blog on Medium. Medium is where you find insightful, critical and analytical writing on a range of topics including the permaculture design system. 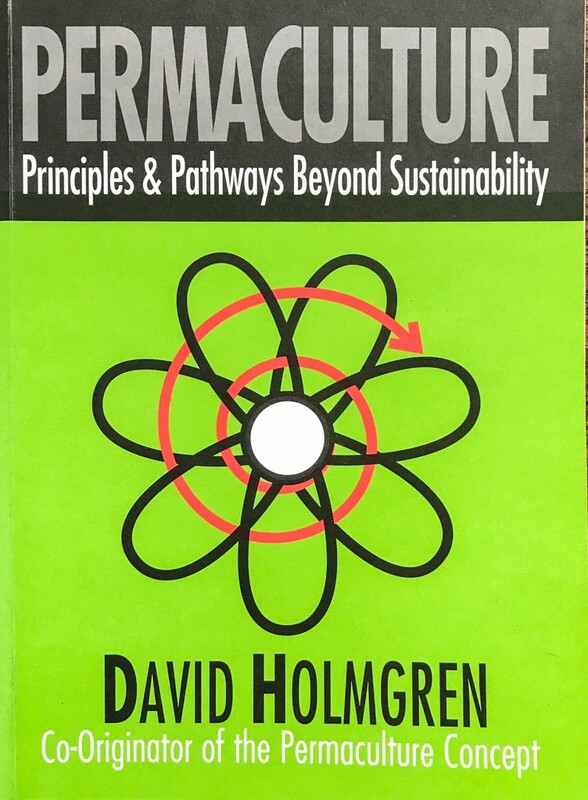 Permaculture: Principles and Pathways Beyond Sustainability; Holmgren D; Holmgren Design Services, Australia. ISBN 9780994392848.